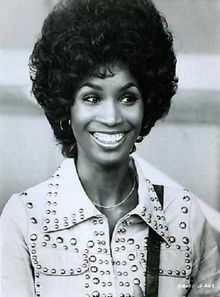 She was one of the first African American women to star in an hour-long TV detective/drama series. And, in the end, she chose faith instead of fame. The woman was Teresa Graves. The show was "Get Christy Love ." "Christy Love" began as a made-for-television movie and became a TV series on ABC for the 1974-75 season of 23 episodes.According to ShadowandAct.com, the concept was based on the novel "The Ledger" by Dorothy Uhnak and the character was originally white. Aaron Spelling produced the series, which the website calls, "a coup (because) ... there weren't exactly many instances at the time in which a black woman played the title role in an American network television program." "Christie Love was a very beautiful and quite charming black woman who also happened to be a skilled undercover operative with the Los Angeles Police Department. Her smarts and skills often came in handy when posing as a prostitute, jewel thief, etc. in an effort to bring down the bad guys." The series mirrors the style of the "Blaxploitation" films that were popular in that era. These were films that were aimed primarily at an urban audience and featured blacks in leading roles. Of the genre -- which included comedies, cops and robbers, and even horror -- Blackflix.com says, "Black heroes were needed in the '70s because the media was busy portraying blacks as revolutionaries and militants." Then, Graves made what she described as "a choice between two loves." She embraced the faith of Jehovah's Witnesses. Guided by her new belief system, and her conscience, she believed there were certain things she could no longer do as an actress. Executive producer David Wolper told TV Guide that "Graves came to his office and gave him a list of what she would no longer do as Love, including knock off bad guys or sexually entice men. 'She was a' superhip policewoman. But you can't shoot anyone, kill anyone. Can't have relationships with anybody, any violence. You can't do a police show based on that.' Producers tried to accommodate her, but the series was dropped after one season." Graves left show business and never looked back. Producer and talent agent Bernie Brillstein told TV Guide, "I wished her good luck ... "I was heartbroken because I hated to see her throw away what I thought she had. But she obviously found something bigger and better." Graves died in a fire at her Los Angeles home, where she cared for her mother, in 2002. A faulty space heater was to blame. She was 54. Some 600 people attended her memorial service. Brillstein added, "She was happy, and that's all you can ask for in life. How many of us can say the same thing?" I think it's a great oversight that Graves and "Christy Love" were not mentioned in PBS' series "Pioneers of Television" alongside Angie Dickinson's "Police Woman." I can't help but wonder why, since the shows ran concurrently.